Don Roy Trio: The Maine Event | Folk Used to Be a Bad Word | Style Weekly - Richmond, VA local news, arts, and events. For Don Roy, Franco-American fiddle playing is a family tradition that started when he was a 6-year-old growing up in Rockland, Maine. He&apos;s now accomplished on guitar, mandolin and banjo too. 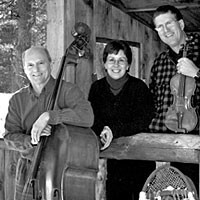 Together with his wife, pianist and step dancer Cindy Roy, and bassist Jay Young, the Don Roy Trio has long entertained southern Maine audiences, often reflecting the Acadian style, incorporating melodies from the Irish and Scottish repertoire for an all-instrumental show. The playing is precise and crisp, all the better for step dancers to take advantage. A lot of foot tapping will be going on, both onstage and off. This style at one time encompassed a great chunk of New England sounds, but it&apos;s mostly limited these days to a handful of veteran musicians in southern Maine, Don Roy being one of the best known. His group has graced the “Prairie Home Companion” radio show twice, Kennedy Center and Carnegie Hall. Saturday: 4:45-5:30 p.m. on the MeadWestvaco Family stage. Sunday: 12-12:45 p.m. on the Dominion stage. Sunday: 4-4:45 on the MeadWestvaco Family stage.